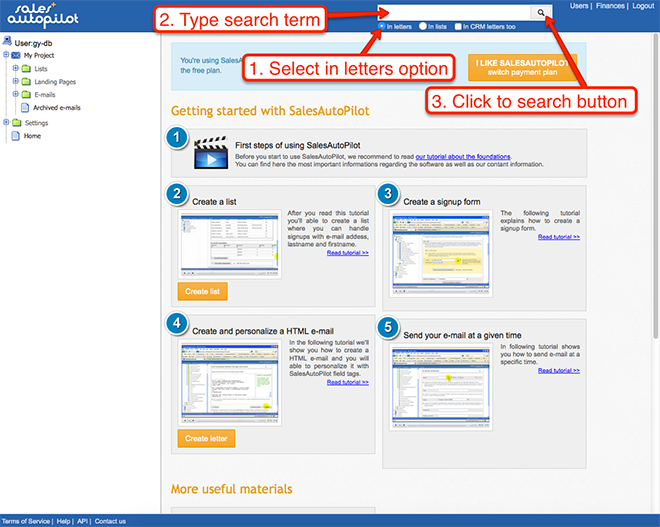 If you have many letters in SalesAutopilot and you want to find a letter based on letter content or subject, use the search panel in the header. Select the "In letters" option. Type your search term. If you want to search in letters sent by a CRM module check the "In CRM letters too" option. Finally, click the Search button. The result will display letters whose content or subject line contains the given term. If you typed more than one keyword the result will retrieve any letters that contain any of the keywords. You can use advanced search operators, please see below. If you checked the "In CRM letters too" option the CRM letters will be shown first and the other letters follow. Click the name of the letter and the letter review page will be displayed along with the delivery schedules. Below the name of the letter there are the preview links. By clicking on the icon you can edit the letter. If you use more than one search keyword there advanced search options available. no operator: this is the default. Retrieve letters where any of the keywords matches in the letter content or subject line. + operator: a leading plus sign indicates that the given word must be present in the letter content or subject line. For example: +sales +marketing In this case, those letters will be in the result that contain both words sales and marketing. - operator: a leading minus sign indicates that this word must not be present in the letter content or subject line. You can combine it with + operator. For example: +salesautopilot -leadpages In this case, those letters will be displayed that contain the word salesautopilot, but don't contain the word leadpages. A phrase that is enclosed within double quotes: the result will display letters that contain the search term literally, as it was typed. For example: "sales automation".